In large bowl, beat softened butter with electric mixer on medium speed until smooth. Gradually add powdered sugar, beating on low speed until combined. Reserve 1/4 cup dulce de leche in small microwavable bowl. Beat remaining dulce de leche into butter mixture with electric mixer on low speed until combined. Place 1 crepe on serving plate. Spread about 1/4 cup dulce de leche frosting on top. Top with another crepe. 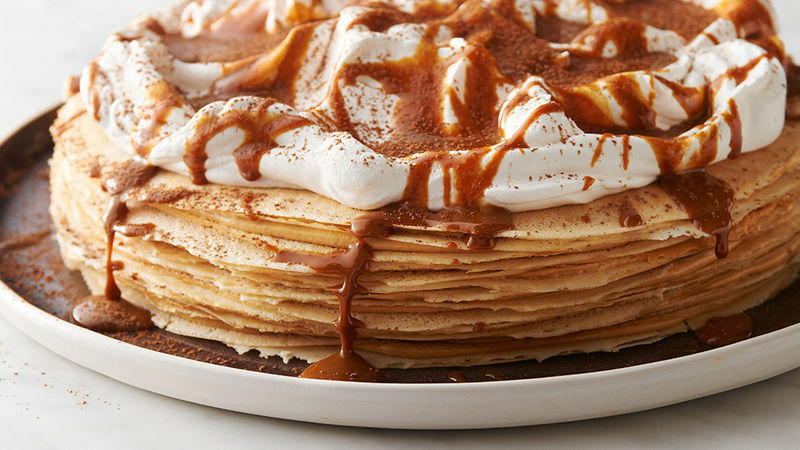 Repeat layers until all crepes and frosting are used, making sure cake is topped with unfrosted crepe. In medium bowl, beat whipping cream with electric mixer on high speed until stiff peaks form. Spoon and spread whipped cream on top of cake. Sprinkle lightly with cocoa. Microwave reserved 1/4 cup dulce de leche uncovered on High 30 seconds, stirring halfway through, until thin enough to drizzle. Cool slightly; drizzle over cake. Serve immediately. Cover and store cake in refrigerator. Love to make crepes from scratch? Swap packaged crepes with your favorite homemade crepes in this recipe.